Stormer Marine builds mainly in aluminum for the leisure and small commercial shipping industries. It offers standard designs in six series of Harbour, Rescue, and Patrol boats, five small Tugboat models, Rib’s, plus five standard Porter series models from this smallest at twenty-one feet, seven inches, marketed worldwide as the Porter 65 Outboard (6.5 Meters) to the largest Porter 100 Inboard at 9.8 Meters or approximately 32 feet. These six series of vessels are in use as fireboats, towboats, harbour duty, patrol, rescue, mooring and line handling tenders, for pollution control, as pilot boats, landing craft, open center console utility boats, and in the case of the Porter series, as multi-purpose workboats. Stormer will re-engineer and customize any of its models according to the customer’s needs and requests and can offer outboard, gasoline or diesel inboard, hybrid power, and even shallow draft jet drive power, depending on the size, model, and hull configuration. 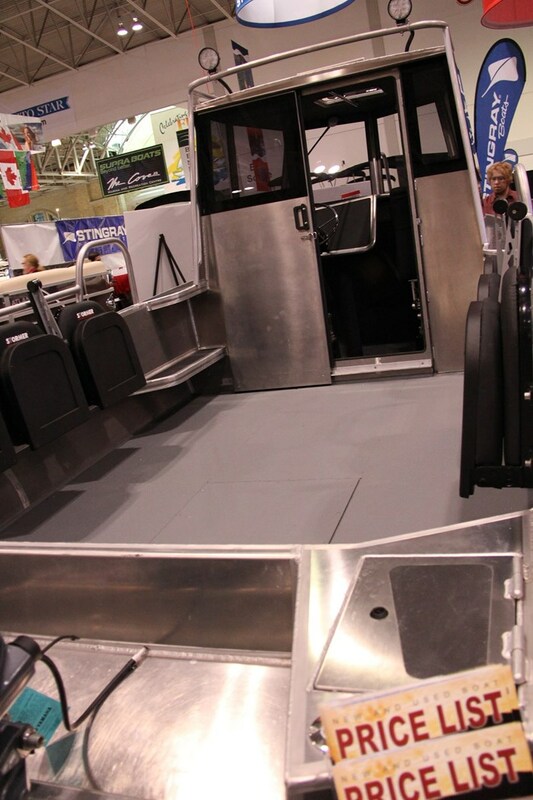 The Stormer Island Porter 21 is a new model designed specifically for the Canadian market and was introduced to Canada at the recent Toronto International Boat Show. For the Canadian market, a pilothouse-style, full stand-up cabin for protection from the weather was added virtually as close to the bow as possible leaving a large, flat, open cockpit aft, approximately 2 x 2.7M (6½ x 8¾ feet) of load carrying space. The cabin has windows all around for excellent visibility, a sliding lockable door, plus side deck walkarounds for access to the bow. 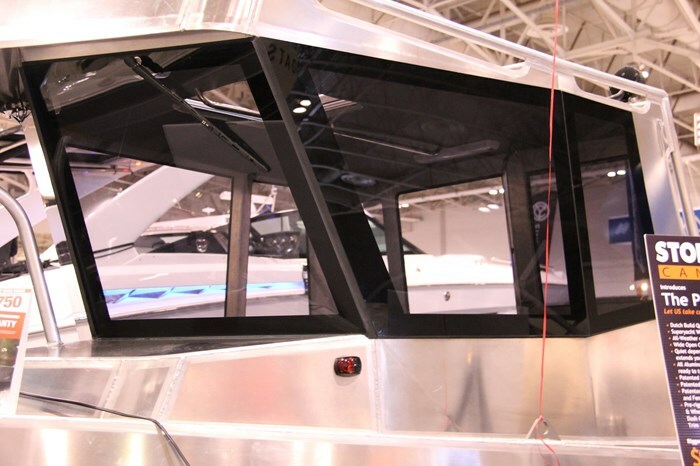 Safety grabrails surround the cabin roof and a chest-high longitudinal safety rail extends from the tugboat-like bow push-pad up, back, and down to the base of the cabin. This bow push-pad is a patented Stormer design and built to be indestructible. Below the enclosed bow of the Island Porter 21 is covered storage space accessible from the pilothouse. A hatch in the roof of the pilothouse is openable for cabin ventilation. 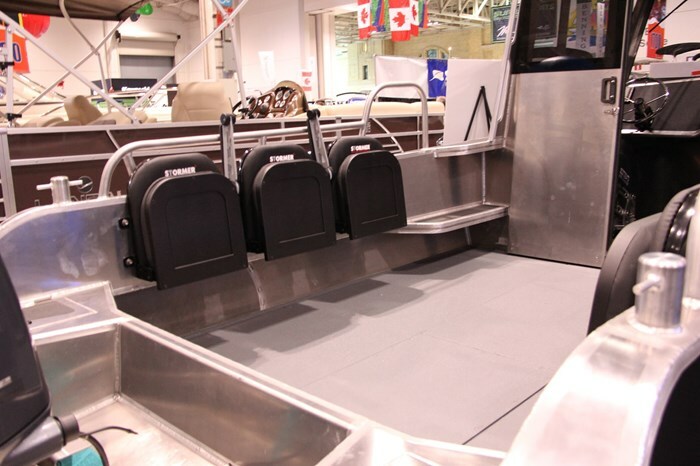 The standard configuration provides seating for three inside including the driver. 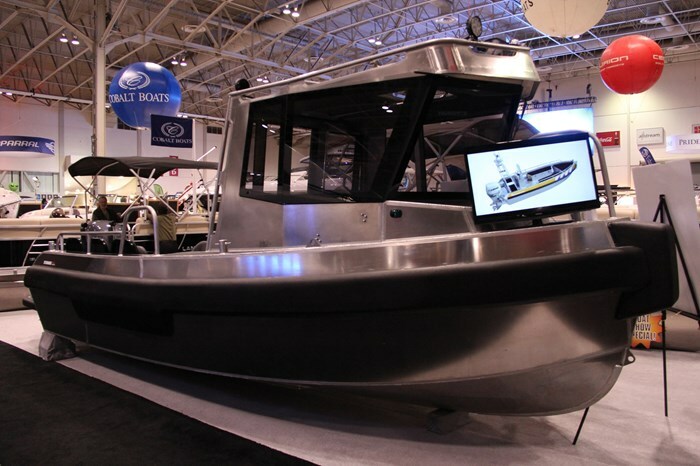 With the modified-vee hull design in aluminum and the standard single 150 horsepower outboard of your choice of Mercury or Yamaha powering the Island Porter 21, the motor-down draft is only 2-feet (0.60M) making this boat ideal for its role of transportation of people, goods, or supplies to the oft-times more remote and less accessible destinations in cottage country and elsewhere. Top speed with a single 150 outboard is said to be 43 mph (70 kph). And you needn’t worry if proper mooring facilities aren’t available as the entire perimeter of the boat, except the transom, is completely covered just below the gunnels with the widest and thickest rubrail you have probably ever seen on a boat of this size. This rubrail is patented Stormer gunwale moulding and fender-guard. And you needn’t worry about losing your footing on a wet or heaving deck either as it is coated with the patented Stormer non-slip floor spray. 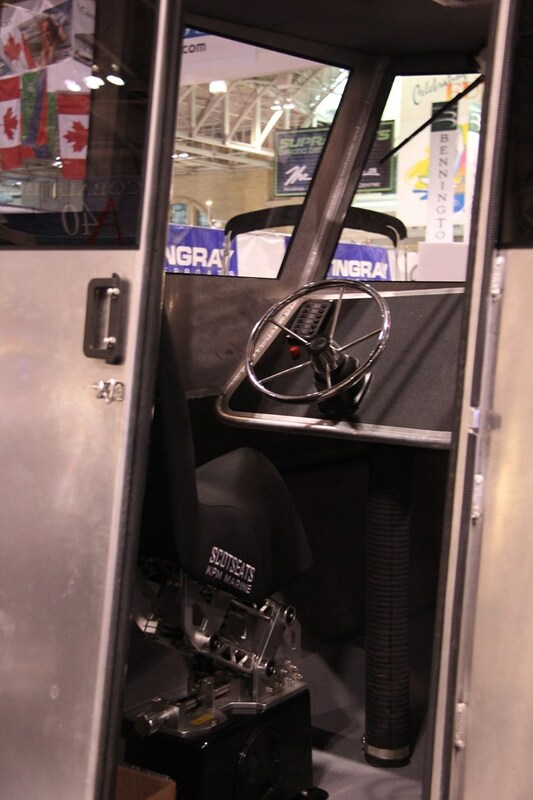 Two half-swim or water access platforms extend off the transom; one on each side of the motor, not only providing handy transom access to the boat on both sides, but also providing some protection to the outboard motor from any above-water obstructions like a wall, dock, or even a rock face. With its eight foot beam and dry weight without motor of 1350 Kilograms (2970 pounds), the Island Porter 21 is readily trailerable, launchable, and retrieveable. It comes pre-rigged with hydraulic steering, speedometer, tachometer, fuel, trim, and temperature gauges plus dual batteries with switch. There are few “standard” options but they include six fold-away “Scott” cockpit seats; three each on each side of the cockpit, an amazing looking “Scott” suspension helm seat, navigation electronics, plus a water ready commissioning kit that includes lines, fenders, safety equipment, etc. However, given the nature and intended purpose of this boat, rest assured you could probably have almost any possible option or item of equipment you could think of installed by the selling dealer. The Stormer Island Porter 21. It’s neat. It’s different. It’s purposeful.